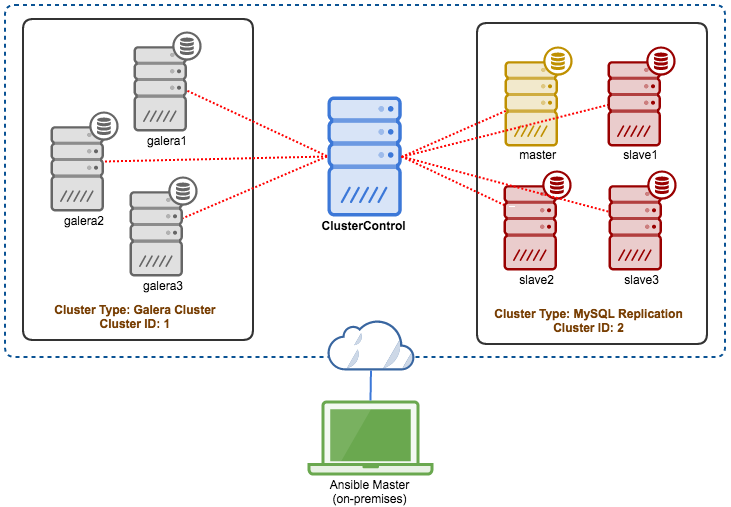 We recently made a number of enhancements to the ClusterControl Ansible Role, so it now also supports automatic deployment of MySQL-based systems (MySQL Replication, Galera Cluster, NDB Cluster). The updated role uses the awesome ClusterControl RPC interface to automate deployments. It is available at Ansible Galaxy and Github. The major improvement is that you can now automatically deploy a new database setup while deploying ClusterControl. Or you can also register already deployed databases. Define your database cluster in the playbook, within the “cc_cluster” item, and ClusterControl will perform the deployment. We also introduced a bunch of new variables to simplify the initial setup of ClusterControl for default admin credentials, ClusterControl license and LDAP settings. 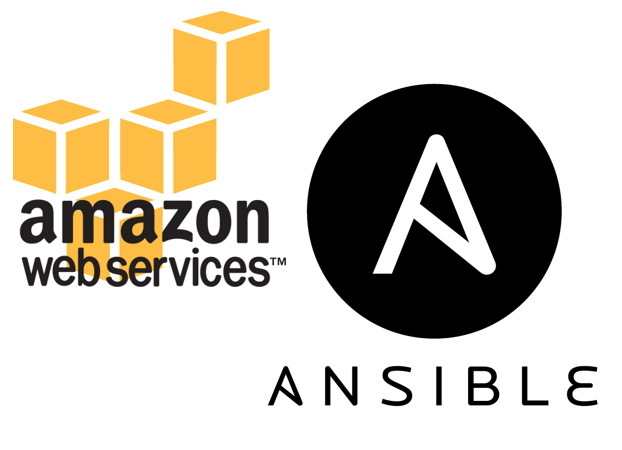 Along with these new improvements, we can leverage the Ansible built-in cloud module to automate the rest of the infrastructure that our database rely on - instance provisioning, resource allocation, network configuration and storage options. In simple words, write your infrastructure as code and let Ansible work together with ClusterControl to build the entire stack. We also included example playbooks in the repository for reference. Check them out at our Github repository page. We are using Ubuntu 14.04 as the Ansible master host in a local data-center to deploy our cluster on AWS EC2. Configure environment variables for ec2.py and ec2.ini. **Note that you can put steps 4 and 5 inside .bashrc or .bash_profile file to load the environment variables automatically. We are going to create 2 playbooks. The first one is the definition of our EC2 instances in AWS (ec2-instances.yml) and the second one to deploy ClusterControl and the database clusters (deploy-everything.yml). There are three types of instances with different instance_tags (Name, set and group) in the playbook. The “group” tag distinguishes our host group accordingly so it can be called in our deployment playbook as part of Ansible host inventory. The "set" tag marks the instances were created by Ansible. Since we are provisioning everything from a local data-center, we set assign_public_ip to “yes” so the instances are reachable inside a VPC under “subnet-9ecc2dfb”. - name: Configure ClusterControl instance. - name: Configure Galera Cluster and Replication instances. - name: Create the database clusters. Setup passwordless SSH from ClusterControl node to all database nodes (tags: dbnodes). In this section, we have to define clustercontrol_ip_address so we know which ClusterControl node is used to manage our nodes. Perform the database deployment. The database cluster item definition will be passed to the ClusterControl RPC interface listening on the EC2 instance that has “tag_group_clustercontrol”. For MySQL replication, the first node in the mysql_hostnames list is the master. The above are the simplest variables used to get you started. For more customization options, you can refer to the documentation page of the role under Variables section. Wait for a couple of minutes until the playbook completes. Then, login to ClusterControl using the default email address and password defined in the playbook and you should be inside the ClusterControl dashboard. Go to Settings -> Cluster Job, you should see the “Create Cluster” jobs scheduled and deployment is under progress. The total deployment time from installing Ansible to the database deployment took about 50 minutes. This included waiting for the instances to be created and database clusters to be deployed. This is pretty good, considering we were spinning 8 nodes and deploying two database clusters from scratch. How long does it take you to deploy two clusters from scratch? We’re in the process of adding support for other cluster types supported by ClusterControl. We’d love to hear your feedback in the comments section below. Would you like to see integration with more cloud providers (Azure, Google Cloud Platform, Rackspace)? What about virtualization platforms like OpenStack, VMware, Vagrant and Docker? How about load balancers (HAProxy, MaxScale and ProxySQL)? And Galera arbitrator (garbd), asynchronous replication slaves to Galera clusters, and backup management right from the Ansible playbook? The list can be very long, so let us know what is important to you. Happy automation! This blog performance benchmarks Google Cloud SQL for PostgreSQL 9.6.10 using pgbench and sysbench.